Starting pitcher Edwin Jackson faced his former club, the World Champion St. Louis Cardinals, for the first time on Monday night since being traded to Washington. It wasn’t a complete game shut it but it was pretty close. 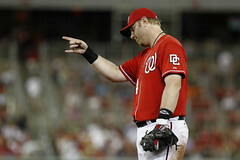 Jackson threw eight innings in an 8-1 game that ended in the Nationals’ favor to start out this three-game series. 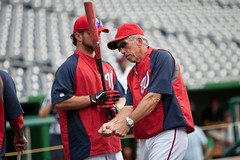 The Nats 1-2 punch at the top of Manager Davey Johnson’s lineup came out of the gate strong to start. Outfielder Jayson Werth drew a walk off Jaime Garcia followed by a two-run laser of a homerun hit to the right field bullpen by rookie outfielder Bryce Harper in the first inning.